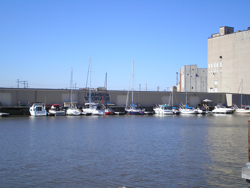 Hansen Marina is located at the mouth of Lake Michigan just west of the Hoan Bridge. No waiting for bridges! Having trouble with water levels at your current marina? We are a deep water harbor, in excess of 14 feet deep. Riverside dock platform with chairs, tables, grills and ice. Great for entertaining! 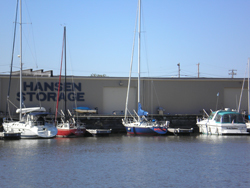 Hansen Marina is within walking distance to great restaurants and shopping, the Summerfest grounds, the Harley-Davidson Museum, and the Broadway Theatre Center. For more information or to arrange slip rental, e-mail Jenni Pratt or call 414-777-1875. Be sure to check out our image photo gallery. Q. Why should we have our records stored and managed off-site?A. Outsourcing your data storage with Hansen Records Management allows you to free up valuable space and focus on what you do best. Hansen provides off-site storage of your documents with a high level of security.